While dragons and unicorns have long topped the A-list of mythical animals, medieval bestiaries are filled with an assortment of bizarre creatures that are scarcely remembered today. Ever heard of a bonnacon, which attacks its opponents with poisonous dung? Then read on. "The name of this beast is variously given as anphivena, amphisbaena, amfivena, and many other variations. But the true spelling of its name is not the least of its mysteries; the exact nature of the amphivena's form was also a source of considerable uncertainty. "The bestiary text tells us that this animal is so called because it has two heads, one in the 'normal position' and one at the end of its tail, and that its body forms a round shape. Isidore of Seville says that the amphivena can 'move in the direction of either head with a circular motion', which seems, understandably, to have been confusing to some bestiary artists. Pliny characterizes it as a violent, poisonous beast, which might account for many of the depictions of it in the act of doubly attacking itself." "The leucrota is somewhat confusingly described as having the rear parts of a stag, and the chest and legs of a lion, but with cloven hooves. Its most distinctive characteristic is its charming wide-mouthed grin, which stretches across its head. Its teeth are single, continuous pieces of bone, and it is capable of imitating the sound of a human voice." "The bonnacon is reported by the bestiary to be found simply somewhere 'in Asia', and has a deceptively normal appearance. In general, it looks like a bull, but has horns that curl backwards so that if someone were to fall on them, they would be uninjured. "Banish any thoughts that the bonnacon is a considerate and gentle animal, however! This creature's true claim to fame is its unique defense mechanism; when threatened, we are told, a bonnacon will spray its attacker with poisonous dung. This excrement 'produces such a stench over an area of two acres that its heat singes everything it touches', and needless to say, it is extremely effective at ending a pursuit. For obvious reasons, bestiary artists were fond of depicting this sort of scene, but some, perhaps moved by delicacy, have declined to illustrate it." 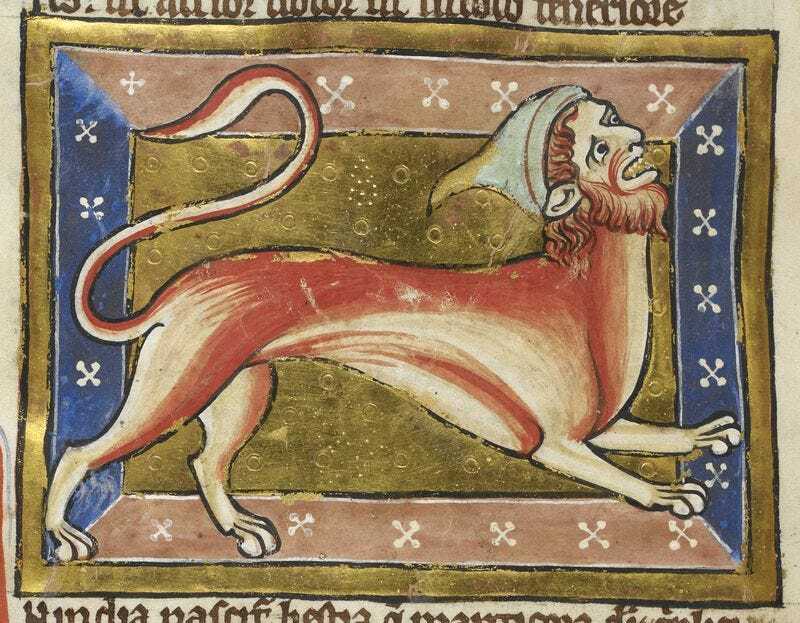 Read about other mythical creatures at the British Library's Medieval Manuscripts blog.